Hamburg or in full Free and Hanseatic City of Hamburg (German: Freie und Hansestadt Hamburg), is a city in the north of Germany on the banks of the River Elbe, 18 km away from the North Sea. 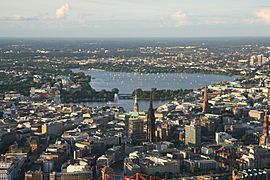 The area of Hamburg is 755.16 km2 (291.6 sq mi). 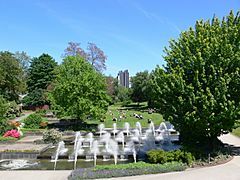 It has an oceanic climate (Cfb in the Koeppen climate classification). 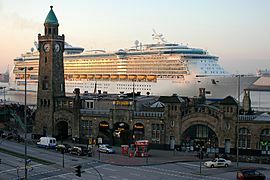 Hamburg has an oceanic climate (Cfb), influenced by its proximity to the coast and marine air masses that originate over the Atlantic Ocean. Nearby wetlands also enjoy a maritime temperate climate. The amount of snowfall has differed a lot during the past decades: while in the late 1970s and early 1980s, at times heavy snowfall occurred, the winters of recent years have been less cold, with snowfall only on a few days per year. 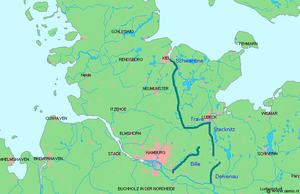 In 1189, by imperial charter, Frederick I "Barbarossa" granted Hamburg the status of an Imperial Free City and tax-free access (or free-trade zone) up the Lower Elbe into the North Sea. In 1265, an allegedly forged letter was presented to or by the Rath of Hamburg. 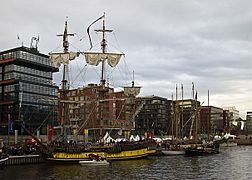 This charter, along with Hamburg's proximity to the main trade routes of the North Sea and Baltic Sea, quickly made it a major port in Northern Europe. 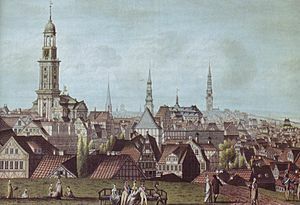 Its trade alliance with Lübeck in 1241 marks the origin and core of the powerful Hanseatic League of trading cities. On 8 November 1266, a contract between Henry III and Hamburg's traders allowed them to establish a hanse in London. 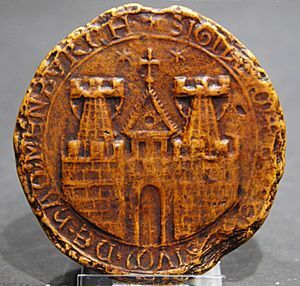 This was the first time in history that the word hanse was used for the trading guild of the Hanseatic League. 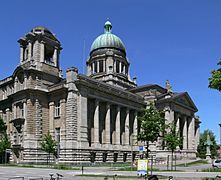 In 1270, the solicitor of the senate of Hamburg, Jordan von Boitzenburg, wrote the first description of civil, criminal and procedural law for a city in Germany in the German language, the Ordeelbook (Ordeel: sentence). 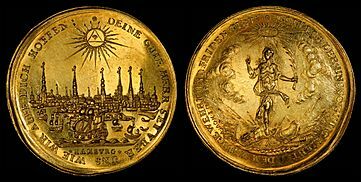 On 10 August 1410, civil unrest forced a compromise (German: Rezeß, literally meaning: withdrawal). 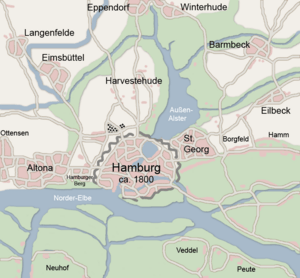 This is considered the first constitution of Hamburg. 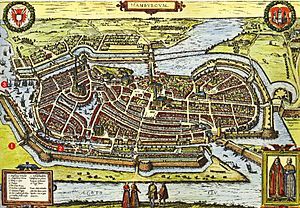 In 1529, the city embraced Lutheranism, and it received Reformed refugees from the Netherlands and France. 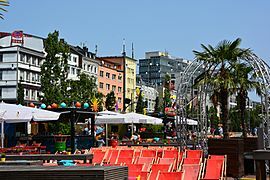 After periodic political unrest, particularly in 1848, Hamburg adopted in 1860 a democratic constitution that provided for the election of the Senate, the governing body of the city-state, by adult taxpaying males. Other innovations included the separation of powers, the separation of Church and State, freedom of the press, of assembly and association. 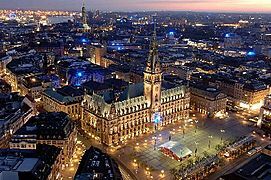 Hamburg became a member of the North German Confederation (1866–1871) and of the German Empire (1871–1918), and maintained its self-ruling status during the Weimar Republic (1919–1933). 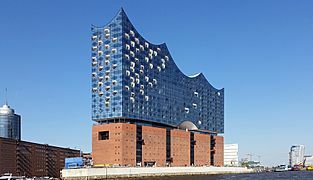 Hamburg acceded to the German Customs Union or Zollverein in 1888, the last (along with Bremen) of the German states to join. 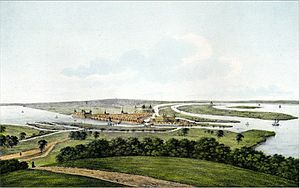 The city experienced its fastest growth during the second half of the 19th century, when its population more than quadrupled to 800,000 as the growth of the city's Atlantic trade helped make it Europe's second-largest port. The Hamburg-America Line, with Albert Ballin as its director, became the world's largest transatlantic shipping company around the start of the 20th century. Shipping companies sailing to South America, Africa, India and East Asia were based in the city. 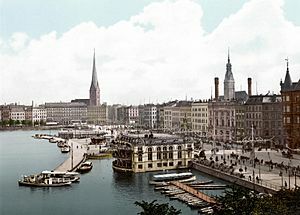 Hamburg was the departure port for many Germans and Eastern Europeans to emigrate to the United States in the late 19th and early 20th centuries. Trading communities from all over the world established themselves there. 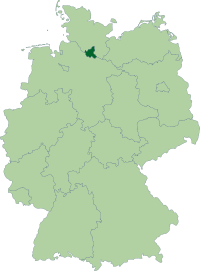 In the Third Reich (1933–1945), Hamburg was a Gau from 1934 until 1945. 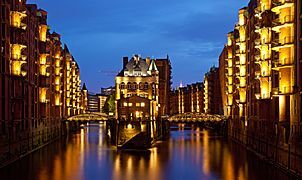 During the Second World War, Hamburg suffered a series of Allied air raids which devastated much of the city and the harbour. 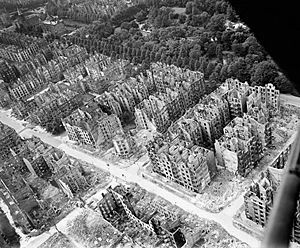 On 23 July 1943, Royal Air Force (RAF) firebombing created a firestorm which spread from the Hauptbahnhof (main railway station) and quickly moved south-east, completely destroying entire boroughs such as Hammerbrook, Billbrook and Hamm South. Thousands of people perished in these densely populated working class boroughs. 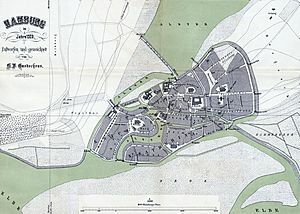 While some of the boroughs destroyed were rebuilt as residential districts after the war, others such as Hammerbrook were entirely developed into office, retail and limited residential or industrial districts. 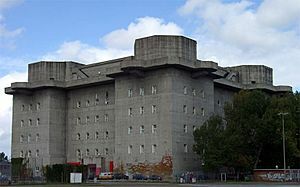 The raids, codenamed Operation Gomorrah by the RAF, killed at least 42,600 civilians; the precise number is not known. About one million civilians were evacuated in the aftermath of the raids. Hamburg surrendered without a fight to British Forces on 3 May 1945. 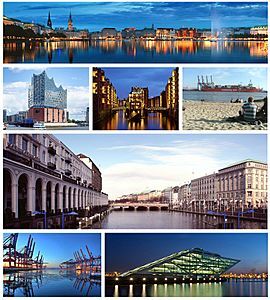 After the Second World War, Hamburg formed part of the British Zone of Occupation; it became a state of the then Federal Republic of Germany in 1949. From 1960 to 1962, the Beatles launched their career by playing in various music clubs in the city. 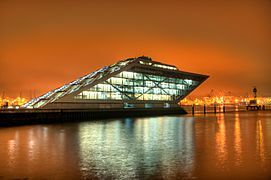 Hamburg's harbour is, by shipments, the second largest harbour in Europe (after Rotterdam) and among the ten largest in the world. It is a very important gate to the countries along the Baltic Sea and Eastern Europe. 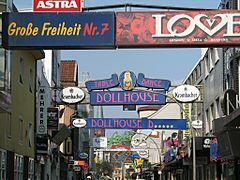 There are about 120,000 businesses in Hamburg. The company Airbus has an assembly plant for large civil aircraft in Hamburg. 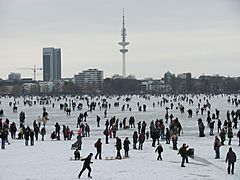 30,000 people are employed in Hamburg's aircraft industries. There are only two other locations worldwide in this scale, Seattle in the United States and Toulouse in France. 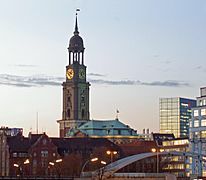 About half of Germany's nation-wide newspapers and magazines are made in Hamburg. 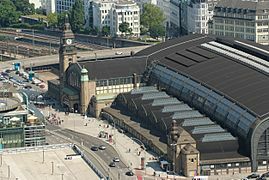 Germany's most-viewed television news Tagesschau is broadcast from Hamburg. 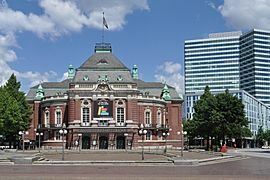 Hamburg Facts for Kids. Kiddle Encyclopedia.